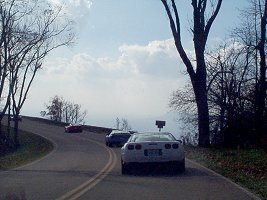 These are the photos from the 2001 Skyline Drive Cruise with the Mid-Atlantic region of CorvetteForum.com. Ray Quayle was a friend of mine who came over from Ol’Blighty for the event, where he was stationed with Lockheed-Martin at the time. Poor guy missed the states and I can’t blame him.